Vorspiel was an exhibition that took place at the Anna Leonowens Gallery (NSCAD University) Halifax, NS. Canada, in January of 2016. The title comes from the German word for "prelude." Directly translated, "vorspiel" also means, "foreplay" and in some Northern European countries is colloquially used to mean, "pre-drinking." Like the multiple levels of translation involved in the title, each of the works in Vorspiel also featured varying levels of interpretation, both in translation and in their references. Following the musical structure, a prelude, after which the exhibition was named, the works were experimental in nature and responded to conflicted attachments to place, identity and memory. Vorspiel, 2016. Process documentation: Michael with a broken stone for Vorspiele. Vorspiel, 2016. Process documentation and printed matter (invitation). Vorspiel, 2016. 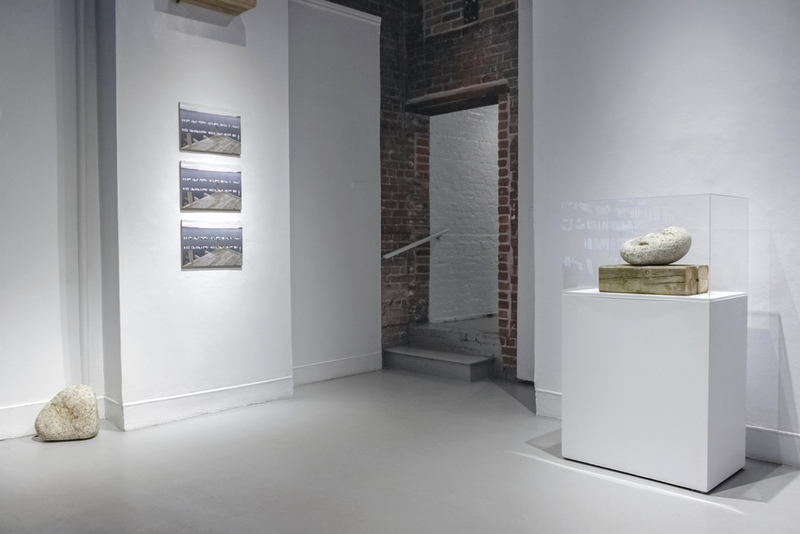 Exhibition installation view with stones in gallery. 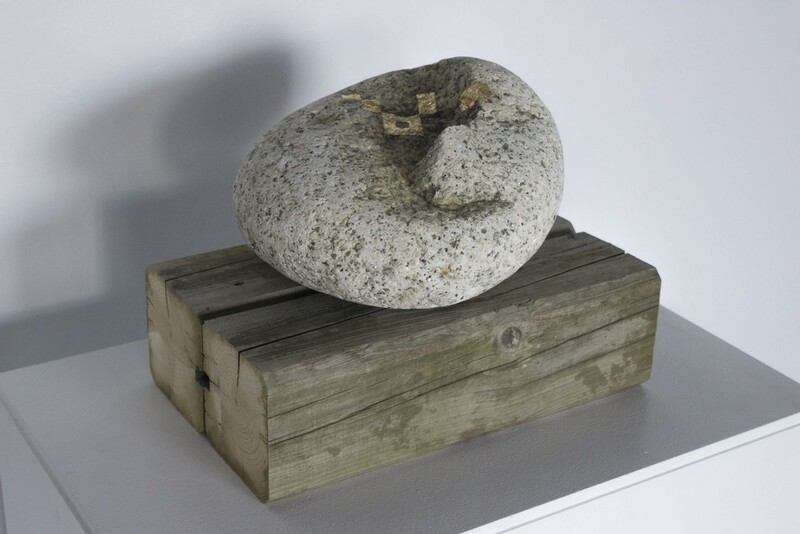 Vorspiel is a series of works first shown at the Anna Leonowens Gallery, Halifax, NS. Canada, in January of 2016. The works in the exhibition reflected on histories of violence and how these stories are obscured by the literal and visual languages that surround artefacts. The title of the exhibition comes from the German word, "vorspiel" meaning both sexually: foreplay, and musically: a prelude -- in either case referencing: the thing that came before. Each of the works from the Anna Leonowens exhibition are shown below. 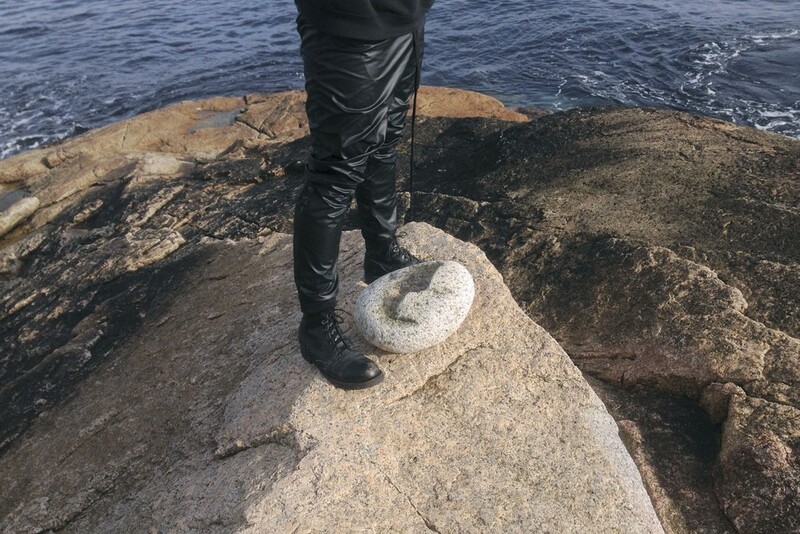 Vorspiele (German plural for "vorspiel") is a series of 4 granite stones gilded with signs derived from naval code flags. Arranged on varying supports throughout the gallery, the coded objects spell out a poem based on the Irish Catholic colloquialism, "you can't get blood from a stone." Installation view from outside of gallery window, showing the frosted acrylic painting, Constellation merging with the reflection of surrounding architecture. 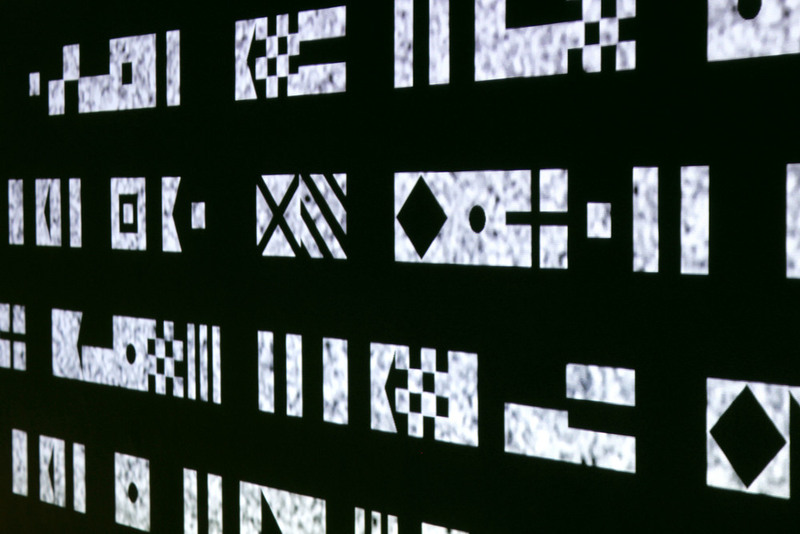 Place Poem (For Jason) is a coded poem whose signs are cut from a video-recording of analogue TV static— suggesting a failure in communication. Place Poem (After Amanda), 2016.
gold foil on gallery wall. 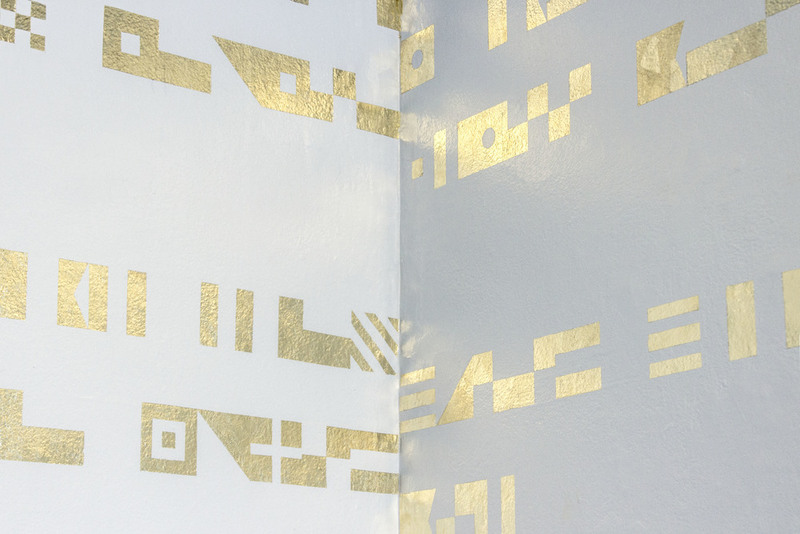 Place Poem (After Amanda) is a poem coded with signs cut from gold foil and gilded onto the gallery walls. 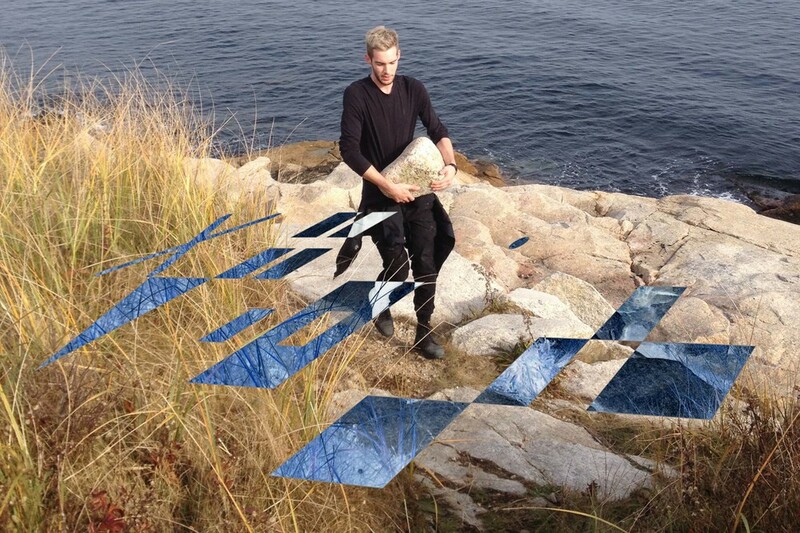 Running, After Askevold responds to the work of Nova Scotian artist, David Askevold. The piece consists of a four second iPhone video which is looped and accelerated using the open source media player, VLC. The acceleration is increased untill distortions appear in the playback of the video. Following Askevold's work, the piece plays with the technologies and environments at hand to explore gaps between fact and fiction.